Threats from Moscow should come as no surprise. In recent years they have included: the deployment of tactical nuclear weapons in Kaliningrad; Russia’s actions during and after the 2008 Georgia-Russia war; and the pre-emptive use of ‘destructive force..… if the situation worsens. ’ This last warning was issued from the Russian Chief of General Staff Nikolai Makarov at the 3 May 2012 missile defence conference in Moscow. The reference is to NATO plans for the deployment of missile defence, and to the expansion of NATO infrastructure closer to the Russian borders. George Kennan and Paul Nitze were the founders of US containment policy and arguably the two Americans who had most experience in dealing with the Soviets/ Russians. They both opposed NATO enlargement. Many know that George Kennan called NATO enlargement a ‘tragic mistake’ and ‘the most fateful error of American policy in the entire post-Cold War era.’ Perhaps less known is the fact that Paul Nitze, author of NSC-68, the document that sought to militarise containment and inspired the neo-conservative movement to build American defence capabilities throughout the Cold War, also strongly opposed NATO enlargement. In many ways, the roots of the contemporary crisis and threat of a new arms rivalry between NATO and Russia stem from NATO’s ‘open-ended’ enlargement into Eastern Europe and the Black Sea/ Caucasus regions. Moscow is concerned that NATO is engaging in an open-ended enlargement and the modernisation of both tactical and strategic nuclear weaponry, in addition to the deployment of missile defence systems throughout much of the Euro-Atlantic region. As countermeasures, Russian President Vladimir Putin has threatened a major nuclear and conventional weapons build-up. This is ostensibly intended to prevent third parties from taking advantage of Russian domestic weaknesses and then seizing Russia’s vast resources. Post-Cold War Russia now controls only a small part of the northeastern shores of the Black Sea, plus naval facilities at Sevastopol, and its major energy export facilities at Novorossiysk lie hemmed in between Ukrainian Crimea and Georgia. But this has heightened Moscow's security concerns, particularly given the prospects of NATO enlargement to Georgia. Moscow has in effect already engaged in anticipatory actions that have been intended to check NATO expansion. It had hoped that the August 2008 Russia-Georgia war would serve to check Georgia’s efforts to obtain full NATO membership. It had also hoped in 2010 to preclude NATO enlargement to Ukraine by extending the lease of the Black Sea fleet at Sevastopol by 25-30 years. 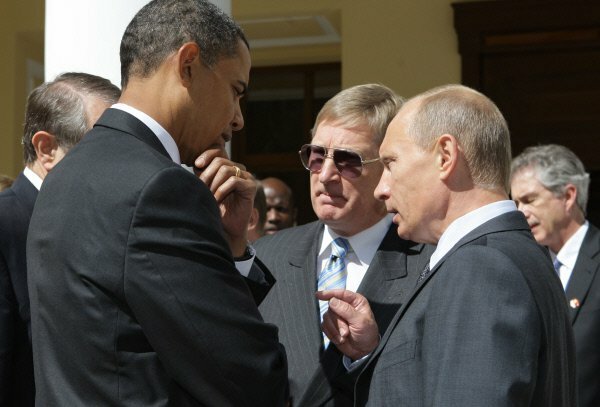 Despite Russian opposition to an open-ended NATO expansion, however, in May 2012 the US Congress urged President Obama to speed up the process of NATO enlargement to Bosnia and Herzegovina, Macedonia, Montenegro, and to Georgia as well. Russian elites have accordingly questioned the reasons for the advance of NATO’s military infrastructure and missile defence capabilities so close to Russian allies and Russian borders. The Netherlands, France, Germany, Spain, and closer to Russia, Turkey, Romania and Poland, have all agreed to host US/NATO missile defence assets. Since George Bush Jr withdrew the US unilaterally from the ABM Treaty in 2002, with no attempt to discuss a revision of the treaty with Moscow, a general lack of trust has developed between the two countries. Russian elites have been concerned with the strategic uncertainties posed by advanced land-based and sea-based missile defence systems. Rightfully or wrongfully, Moscow has argued that the future generation of US missile defence interceptors planned for deployment around 2020 potentially have the capacity to target Russian ICBMs. Moscow is further concerned that the process of NATO enlargement, coupled with the deployment of missile defence systems, is being accompanied by the modernisation of both intercontinental and tactical nuclear weapons. This nuclear modernisation is supported by Congress as a trade-off for Obama to obtain Congressional backing for the New START treaty. The Pentagon’s multi-billion dollar modernisation of the B-61 nuclear gravity bomb is intended to provide it with enhanced precision targeting abilities. A major issue, however, is that this could be used politically by Russia to justify its own heavy reliance upon tactical nuclear weaponry, if neither side can eventually reach an accord that might reduce or eliminate such weaponry altogether. Given these ominous circumstances, it is time to ‘reset the reset button’ with Russia in order to prevent a very dangerous situation spiralling out of control. The leaderships in Washington, Europe and Moscow need to explore Russian calls for a new Euro-Atlantic security pact. Moscow should be drawn into joint NATO-Russian cooperation with regard to missile defences, strategic and tactical nuclear weapons reductions (and eliminations) and the collapse of the adapted Conventional Force in Europe (CFE) treaty, among other security concerns. The US and Europe should engage thoroughly in concerted diplomacy with Russia on the question of the Iranian missile and purported nuclear weapons programme in an effort to convince Tehran that a regional— if not a global— arms rivalry is definitely not in anybody’s interest. To prevent a new post-Cold War arms rivalry, the US and Europe need to engage Russia in real power-sharing arrangements that lead to NATO-Russian cooperation with states throughout Eastern Europe and the Caucasus. The goal should be to increase confidence and introduce security-building measures on the ground in order to facilitate improved development of the entire Euro-Atlantic community. Such an approach would require the establishment of three International Peace Centres in Kaliningrad, Sevastopol and Cyprus. NATO’s Partnership for Peace (PfP), among other international organisations and Non-Governmental Organisations (NGOs). Each Centre could find ways to develop confidence and security-building measures, inspect weapons systems, deploy peacekeepers, engage in the joint NATO-Russian-European protection of energy transit routes and coordinate social and economic policies. Where necessary, they could also engage in the implementation of joint missile defence systems. Each of these Centres could take on many possible roles, such as helping to counter terrorism, human trafficking and drug smuggling, among other illicit activities. As Kaliningrad, Sevastopol and Cyprus each represent a key geo-strategic and geo-economic focal point of contention, an International Peace Centre in each region could significantly reduce tensions throughout the Euro-Atlantic community. An International Peace Centre in Kaliningrad could help reduce tensions between Russia, Belarus, Germany and the Baltic states (as well as Russian tensions with the European Union and NATO). A similar Centre in Sevastopol could reduce tensions between Russia and Ukraine (as well as Russian tensions with the European Union and NATO). Another Centre in Cyprus could reduce tensions between Turkey and Greece (as well as between Turkey, Israel and the European Union). In effect, Kaliningrad would be neutralised. In that way Russia would not be able to threaten the deployment of tactical nuclear weaponry, for example, but neither would Kaliningrad secede from Russia. Tensions between Ukraine and Russia could likewise be reduced, so that Russia would not claim it needed such a heavy naval and military presence in Sevastopol to protect its energy exports. Compromise between Greece and Turkey over Cyprus and energy sources in the eastern Mediterranean could also lead to the expansion of trade throughout the Mediterranean and Black Sea regions, eventually helping Greece and the EU lift itself out of the global financial crisis, in cooperation with Russia now entering the World Trade Organisation. Meanwhile, a portion of the revenues from the vast energy sources found in the eastern Mediterranean could help finance the costs of conflict resolution throughout the region, including Cyprus, the Caucasus, if not Israel and the Palestinians. As an alternative to NATO enlargement to Georgia, for example, a Sevastopol Peace Centre would seek to implement a Black Sea/ Caucasus ‘regional security and development community’, thus providing security for the whole southern Caucasus region, in cooperation with Russia. Rather than pressing for the strategic integration of Georgia back into NATO’s command, as still advocated by NATO and the US Congress, the US, Europeans and Russians would extend overlapping security guarantees to Georgia and to the other states of the Caucasus—in an effort to foster greater regional integration. These temporary deployments would be similar to the 1995 Dayton peacekeeping accords for ex-Yugoslavia, working in coordination with, or else replacing, Russian/CSTO forces. As opposed to enlarging NATO, this alternative approach could also help overcome the present impasse over the adapted CFE Treaty, from which Moscow withdrew in 2007 and from which the US withdrew in late 2011. The real ‘threat’ to Russia stemming from NATO enlargement is not a NATO-led attack and an attempt to seize Russia’s vast resources, as Vladimir Putin has implied. It is the more plausible scenario that a number of burgeoning regional conflicts could, in the not-so-distant future, draw NATO and Russia directly into conflict on opposing sides. If the two sides are unable soon to reach a new diplomatic accord, the collapse of the adapted CFE treaty, combined with an ‘open-ended’ NATO enlargement accompanied by intercontinental and tactical nuclear weapons modernisation and the deployment of advanced missile defence systems represent factors that could unleash a new NATO-Russian arms rivalry. A dangerous arms rivalry can be prevented by re-thinking the ‘open-ended’ NATO enlargement and by implementing a new global strategy intended to bring Russia and the Black Sea region into a larger Euro-Atlantic confederation.